These Terms and Conditions of Sale (“Conditions”) set out the agreement between the Bidder/Buyer, on the one hand, and Prop Store and the Seller, on the other hand. By registering to bid and participate in a Prop Store Auction, you will be deemed to have read and agreed to be bound by these Conditions. 2.2. Prop Store’s staff are not professional restorers so descriptions of Lots, images and statements of condition in Prop Store’s catalogue or on its website are for illustrative purposes only. Prop Store cannot guarantee that colors are properly shown. Save for Prop Store’s Terms of Guarantee of Attribution, all Lots are sold “as is.” Bidders are encouraged to inspect Lots and satisfy themselves as to their condition before bidding, seeking and obtaining independent professional advice where required. 2.3. Condition reports are available for each Lot upon written request. 3.1.2. To register, each person or Company must complete and return a bidder registration form available online at www.propstore.com/auction, which must include valid Visa, MasterCard or American Express credit card details to be held on file. 3.1.3.4. Inform the Bidder about other auctions, products and services provided by Prop Store and its affiliates (please contact Prop Store by email at enquiries@propstore.com or by phone +1 818 727 7829 if you do not wish for your information to be used for such a purpose). 3.2.1. At Bidder’s request, without any liability therefor, Prop Store can provide shipping estimates during the Auction. Any Bidder requesting this information should email shipping@propstore.com including the Lot number and shipping address at least 5 days before the close of the Auction. Real-time shipping estimates are also available on many lots through the online bidding platform. 4.1.1 This is a No Reserve auction. No estimate anywhere in any media by Prop Store of the selling price may be relied upon as a prediction of the actual selling price. Notwithstanding the same, until the start of the Auction by the auctioneer, Prop Store may, in its sole discretion, withdraw any Lot from sale at Auction. 4.2.1. Prop Store reserves the right to refuse admission and/or participation in the Auction and to reject any bid. 4.2.2. Bids may not be accepted from unregistered bidders and all Bidders must be 18 years of age or over. All bids must be made in US dollars. 4.2.8. Except as expressly stated in the Conditions, Prop Store shall have no liability arising out of or related to any errors or omission in respect of bids made online. 5.1.1. Prop Store will notify the Buyer and send (by email unless requested otherwise) a payment invoice setting out the Purchase Price and itemizing the Hammer Price, the Buyer’s Premium, and if applicable Buyer’s Expenses, plus any applicable sales tax, within 7 business days of the end of the Auction. For all sales within California, sales tax at the prevailing rate (currently 8.75%) will be applied to the Purchase Price. Delivery addresses outside California will be exempt from sales tax. 5.1.4. Prop Store offers no grace period on payment plan deadlines. If the Buyer does not adhere to payment deadlines as set forth above, the Buyer shall be deemed to be in default. In the event of default all funds already paid to Prop Store shall be retained by Prop Store as liquidated damages. Moreover, Prop Store and/or the Seller shall also be entitled to any other remedies available, whether in law or equity. 5.1.9. The Buyer shall be charged in US Dollars for the Purchase Price. For all sales within California, sales tax at the prevailing rate (currently 8.75%) will be applied to the Purchase Price. Delivery addresses outside California will be exempt from sales tax. 5.2.2. If any applicable condition listed herein are not complied with (to a material extent), the Buyer will be in Default and in addition to any and all other remedies available to Prop Store and/or the Seller by law, including, without limitation, the right to hold the Buyer liable for the total Purchase Price, including all fees, charges and expenses more fully set forth herein, and as set forth in section 4.2 herein, Prop Store, at its option and to the extent permitted by law, may (i) cancel the sale of that, or any other items sold to the defaulting Buyer, retaining as liquidated damages all payments made by the Buyer, (ii) resell the purchased item, or (iii) effect any combination thereof. In any case, the Buyer shall be liable for any deficiency, any and all costs, handling charges, late charges, expenses of both sales, legal fees and expenses, collection fees and incidental damages. 5.3.3. It is the Buyer’s sole obligation and responsibility to be aware of, to comply with, and to pay for all relevant import duties, taxes, VAT, customs and other fees charged in the area of delivery. Prop Store will ship all packages with the full value of the Lot declared. The Buyer understands and agrees that Prop Store shall have no obligation or responsibility for any import duties, taxes, VAT, customs, shipping or other charges for the Lots shipped. Failure by the Buyer to pay all necessary amounts may result in the relevant authorities returning the Lot to Prop Store and in those circumstances the Buyer will be charged and will pay storage costs and Prop Store’s additional reasonable costs and expenses. 5.3.6. Should the Buyer make his or her own arrangements with third parties for shipping, handling, or delivery of any Lots, Prop Store shall have and accepts no liability or responsibility for the acts or omissions of any such third parties. Similarly, where Prop Store suggests other handlers, packers or carriers, its suggestions are made on the basis of its general experience of such parties in the past. Although Prop Store shall use reasonable efforts to take care when selecting third parties for shipping and delivery, the Buyer understands and agrees that Prop Store is not responsible to any person to whom it has made a recommendation for the acts or omissions of the third party concerned. 5.4.2. Prop Store will not be liable or responsible for any failure to perform, or a delay in the performance of, any of its obligations under these Conditions that is caused by an event outside its control, including without limitation strikes, lockouts or other industrial actions by third parties, civil commotion, riot, invasion, terrorist attack or threat of terrorist attack, war (whether declared or not) or threat or preparation for war, fire, explosion, storm, flood, earthquake, subsidence, epidemic or other natural disaster, or failure of public or private telecommunications networks. Prop Store’s obligations shall be suspended and time for performance extended until such time as the event outside its control is over, following which a new collection or shipping date can be agreed. 6.1. Prop Store warrants that the attribution of each Lot as stated in the title block (film title and item title) of that Lot in the Auction catalog, subject to any revisions (which may be given in writing or online before or during the Auction at which the Lot is purchased by the Buyer); this is Prop Store's Guarantee of Attribution. Buyers should be aware that multiple examples of props and costumes are frequently used during production and it is often impossible to determine whether a specific prop has actually been used on-camera. Any specific on-camera usage known to Prop Store will be noted within the description, but no warranties are given by Prop Store on that description. 6.2. If a Buyer demonstrates to Prop Store’s reasonable satisfaction that the Guarantee of Attribution is materially incorrect, the sale will be rescinded if the Lot is returned to Prop Store in the same condition in which it was at the time of sale. In order to satisfy Prop Store that the Guarantee of Attribution is materially incorrect, Prop Store reserves the right to require the Buyer to obtain, at the Buyer’s sole cost and expense, the opinion of two experts in the field, mutually acceptable to Prop Store and the Buyer. 6.3. In the event a sale is rescinded in accordance with Paragraph 6.2, Prop Store shall repay to the Buyer the Purchase Price. Repayment of the Purchase Price shall be the Buyer’s sole remedy, to the exclusion of all other remedies to the extent permissible at law. It is specifically understood that this will be considered the sole remedy. 6.6. Except as expressly provided in these Conditions Prop Store shall have no liability to the Buyer in respect of a Lot and all and any implied warranties and conditions are excluded to the fullest extent permitted by law. 7.1. The copyright in all images, illustrations and written material produced by or for Prop Store relating to this auction, is and shall remain at all times the property of Prop Store. The purchase of these items does not include ownership in or to the trademarks registrations, copyrights and/or any other intangible intellectual properties associated with this item. Therefore purchase of this item does not permit the Buyer to replicate or to exploit this item otherwise. All intellectual property rights in and to any images, illustrations, logos, and any and all other material provided by Seller in connection with the Auction or otherwise related to the motion picture properties on which the Auction is based, are and shall at all times remain the sole and exclusive property of the Seller. The sale of the Lot items hereunder does not include the right or license to use, and any Bidder or Buyer may not at any time (or for any purpose) use or reference, the title of the motion pictures, the trademarks, logos, character names or likenesses, scenes, artwork, or any other element of or in connection with the motion pictures on which this Auction is based. The Buyer agrees to indemnify and hold harmless Prop Store and the Seller and its and their respective directors, employees, affiliates, contractors and agents from and against any and all third-party claims, actions, suits, judgments, losses, damages, costs and expenses (including reasonable attorneys’ fees) asserted against or incurred by any of the aforementioned parties that arise out of or result from any act or omission by the Buyer or arising out of or relating to the Buyer’s infringement of any copyrights or trademarks in or to the items or Images. 7.2. Prop Store neither warrants nor represents that the Buyer’s use of any materials displayed on the site will not infringe the rights of third parties not owned by or affiliated with Prop Store. 7.8 Each bidder acknowledges and agrees that the technology and the website provided by prop store in connection with the auction is “as is,” without any warranties of any kind and that prop store does not represent or warrant that the technology or the website will be uninterrupted or error free. Each bidder acknowledges and agrees that the prop store shall have no liability, responsibility or obligation for any claim, demands, causes of action or damages of any kind arising out of or relating to any interruptions or errors in the technology or the website offered or utilized in connection with the auction. 7.9 Bidder/s (including browsing) of this auction is at Bidder’s own risk. Neither Prop Store nor any other party involved in creating, producing, or delivering this listing is liable for any direct, incidental, consequential, indirect, or punitive damages arising out of your access to, or use of, the site. Prop Store also assumes no responsibility, and shall not be liable for, any damages to, or viruses that may infect, Bidder’s computer equipment or other property on account of Bidder’s access to, use of, or browsing in the Site or Bidder’s downloading of any materials, data, text, images, video, or audio from the site. 8.2. Other than the Seller, the Buyer and Prop Store, no other person shall have the right to enforce any of the terms set forth hereunder. Prop Store’s “The Twilight Saga” Registration Giveaway (hereafter, “Promotion”) is open to anyone who is eighteen (18) years of age or older, or the age of majority in their place of residence, whichever is older, as of the date of entry. Void where prohibited or restricted by law. Officers, board of directors, employees, representatives and agents of The Prop Store of London, Inc., Summit Entertainment, LLC (“Summit”), and their respective subsidiaries, affiliates, owners, shareholders, officers, directors, agents, representatives and employees, and the immediate family members (parent, spouse, child, or sibling, and their respective spouses, regardless of where they reside) of such officers, directors, employees, representatives and agents, and those living in their same households, whether or not related, are not eligible to enter or win any of the available prizes (the “Prizes”). All applicable country, federal, state and local laws apply. Summit is not responsible for the collection, submission or processing of entries, the administration of the Promotion, the selection of winners or the fulfillment of prizes. The sponsor, host and administrator of the Promotion is The Prop Store of London, Inc. (“Prop Store”): 28014 Harrison Pkwy, Valencia, CA, 91355. Prop Store will provide the website and service on which the Promotion will take place and monitor the audience of the live stream, controls all official time-keeping functions, and select the winner of the Promotion. Participation in the Promotion constitutes entrant’s full and unconditional agreement to and acceptance of these official rules (“Official Rules”) and decisions of Prop Store, which are final and binding. Winning the Prizes is contingent upon fulfilling all requirements set forth herein. Promotion begins 12:01:00 am Pacific Time (“PT”) on _October 11, 2017 and ends on or about _09:00 am PT on _November 6, 2017 (the “Promotion Period”). Entries submitted before or after the Promotion Period will not be eligible. ENTRY IS FREE. NO PURCHASE OR PAYMENT OF ANY KIND IS NECESSARY TO ENTER OR WIN THIS GIVEAWAY. Each valid entry will have an equal chance of winning. 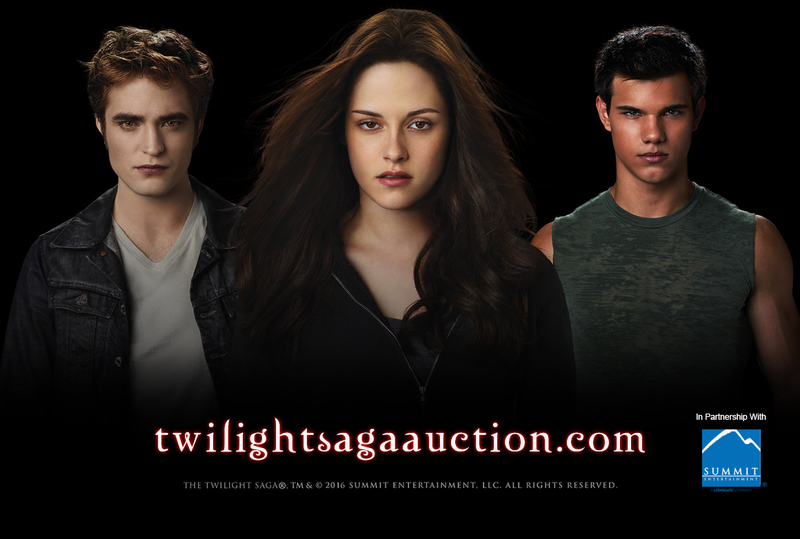 All entrants who register to bid in the “The Twilight Saga” Online Auction to be held by Prop Store on _November 6, 2017 to _November 17, 2017, will automatically be entered in the Promotion. If you do not wish to be entered in the Promotion, please check the appropriate box during registration to opt-out of entry. Until the commencement of the “The Twilight Saga” Online Auction on _November 6, 2017, one (1) winner will be selected in a random drawing conducted each week on Wednesday at or about _1:00 pm PT from among all the valid entries received. Prop Store will announce the winning entry via e-mail. Noncompliance with these Official Rules, the inability of Prop Store to contact the potential winner, or a prize or prize notification being returned as non-deliverable may result in disqualification and an alternate winner being selected at Prop Store’s discretion. Entrants agree, by entering, that Prop Store reserves the right to conduct a background check and that entry in the Promotion constitutes entrant’s permission for Prop Store to conduct such background check, provided that, to the extent additional authorization is necessary, entrants shall authorize such check. Prop Store reserves the right (at its sole discretion) to disqualify any entrant based on the results of the background check or failure of the entrant to properly authorize such check. You are not a winner until all required submissions have been received and validated by Prop Store. No transfer, assignment, or substitution of prize is permitted except by Prop Store who may substitute the prize with one of comparable or greater value, at its sole discretion for any reason whatsoever. All other costs not specifically stated herein as being awarded as part of the prize, including, but not limited to, all federal, state and local taxes, VAT, import duties, customs fees and taxes, if any, are the sole responsibility of the winner. The value of the prize will be treated as income to the winner and the winner will be responsible for payment and reporting of all applicable taxes. Prop Store encourages you to consult your tax advisor to determine how winning this prize may affect your tax obligations. Odds of winning the Prizes depend on the total number of eligible entries received throughout the Promotion Period. The use of script, macro or other automated devices such as bots (or any other devices intended to automate or subvert any aspect of entry) to participate in the Promotion is prohibited and any entry through such means and any entry that is deemed to be ineligible (at Prop Store’s sole discretion and in accordance with these Official Rules) will be void. In the event of a dispute as to the identity of an entrant, the entry and prize will be awarded to the individual assigned to the email address used to register for the “The Twilight Saga” Online Auction, provided such individual is eligible according to these Official Rules. Released Parties are not responsible for late, lost, stolen, incomplete, misdirected, delayed, garbled, damaged entries or for telephonic, human or computer failures, problems or errors, interruptions in service due to system upgrades, repairs, modifications or other causes, failures or malfunctions of connections, satellite, network, cable, Internet Service Provider (ISP), phones, phone lines or telephone systems, traffic congestion on the internet, technical or mechanical malfunctions, or other malfunctions or errors, whether caused by equipment, programming, human error or otherwise relating to or in connection with the Promotion, including, without limitation, errors which may occur in connection with the administration of the Promotion, entries, or the announcement of the prize; or for any injury or damage to entrant’s or any other person’s computer relating to or resulting from participation in this Promotion, or for printing, typographical, human or other errors appearing in these Official Rules or other Promotion-related materials. Prop Store reserve the right, in their sole discretion, to: 1) disqualify any entrant and void any entries of entrants who it believes have attempted to tamper with or impair the administration, security, fairness or proper use of this Promotion or are in violation of these Official Rules; 2) modify, terminate or suspend this Promotion should unauthorized human intervention or any other causes corrupt or impair the administration, security, fairness or proper use of the Promotion, or for any other reason, as determined by Prop Store in its sole discretion. Any attempt to deliberately damage the website or undermine the legitimate operation of this Promotion is a violation of criminal and civil laws, and, should such an attempt be made, Prop Store reserves the right to seek any all remedies from any such person(s) responsible for the attempt to the fullest extent of permitted by law. As some jurisdictions do not allow the limitation or exclusion of liability for incidental or consequential damages, applicability may vary by location. Prop Store makes no warranties, and hereby disclaims any and all warranties, express or implied, concerning any prize furnished in connection with the Promotion. WITHOUT LIMITING THE GENERALITY OF THE FOREGOING, SUCH PRIZES ARE PROVIDED “AS IS” WITHOUT WARRANTY OF ANY KIND, EITHER EXPRESS OR IMPLIED, AND SPONSOR HEREBY DISCLAIMS ALL SUCH WARRANTIES, INCLUDING BUT NOT LIMITED TO, THE IMPLIED WARRANTIES OF MERCHANTABILITY, FITNESS FOR A PARTICULAR PURPOSE AND/OR NON-INFRINGEMENT. Except where prohibited, entrants agree that (1) any and all disputes, claims and causes of action arising out of, or connected with, the Promotion or any prize awarded shall be resolved individually, and not as a participant in any class action, and exclusively by the state or federal courts located in Los Angeles County, California; and (2) each entrant specifically agrees to the jurisdiction of the state or federal courts located in Los Angeles County, California. Under no circumstances will entrant be permitted to obtain a judgment for, and entrant hereby waives all rights to claim, punitive, incidental or consequential damages, or any other damages, including attorneys’ fees, other than entrant’s actual out-of-pocket expenses (i.e., costs directly attributable to participating in this Promotion), and entrant further waives all rights to have damages multiplied or otherwise increased. All issues and questions concerning the construction, validity, interpretation and enforceability of these Official Rules, or the rights and obligations of entrant and Prop Store in connection with the Promotion, shall be governed by and construed in accordance with the substantive laws of the State of California, without regard to its choice of law provisions. By entering, entrants agree to be bound by these Official Rules and the decisions of Prop Store, which are final and binding in all matters relating to this Promotion. Entrants agree, by entering the Promotion, Prop Store, Summit, and their respective parents, affiliates, subsidiaries, shareholders, members, officers, board of directors, representatives, employees, agents, retailers, distributors, suppliers, and advertising and promotion agencies (collectively, the “Released Parties”) shall have no liability and will be held harmless by entrant for any claim, action, liability, loss, injury or damage to entrant or any other person or entity, including, without limitation, personal injury or death to entrant or any other person or damage to personal or real property, due in whole or in part, directly or indirectly, to the acceptance, possession, use or misuse of the prize or participation in this Promotion.